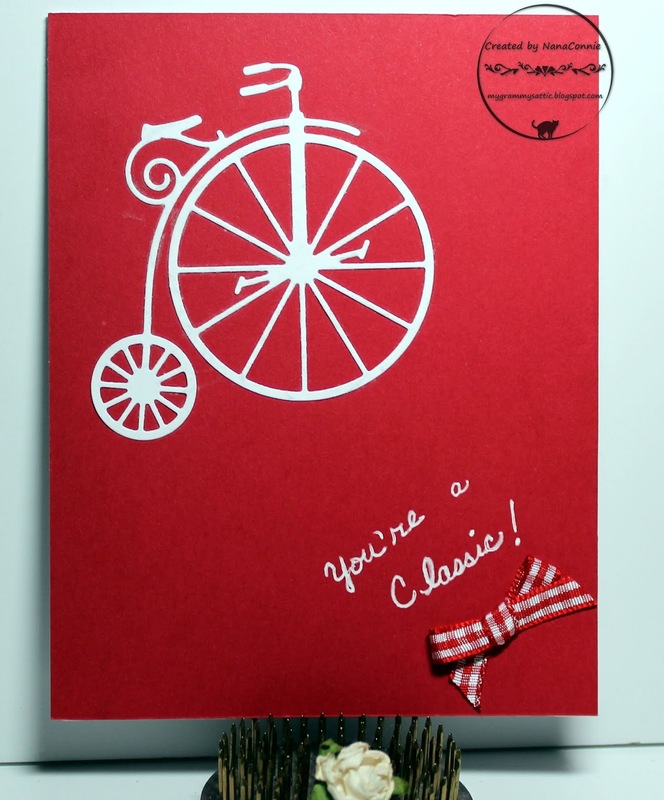 Several years before he passed on, my hubby owned a bicycle shop and his trademark symbol was a hand drawn penny farthing bicycle with a quirky little guy riding it. After the shop was sold to his partner, hubby kept the reproduction penny farthing I had bought for him which hung in the shop window as an advertisement. A dear blogging buddy (and now fellow DT once again), Lynn H., sent me this fabulous die cut and I had to get it made into a card as soon as possible. Sorry, I don't know the maker of the die. In Lynn's honor, the design is CAS because she does the most incredible CAS designs I've seen. Thanks, Lynn! 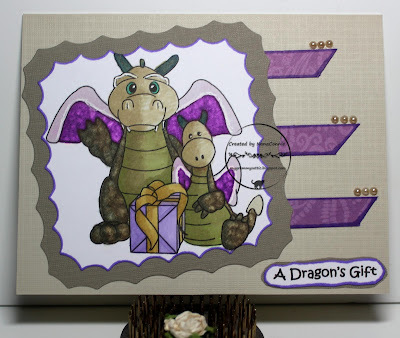 The sentiment is done with VersaMark ink, then heat embossed with white embossing powder. 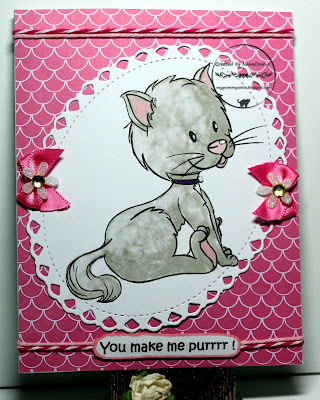 I really love heat embossing! There's nothing like watching it as the powder melts and takes on a shine. As many years as I've been doing it, it still fascinates. I found a scrap of gingham ribbon, tied a bow and added it as the only embellishment. 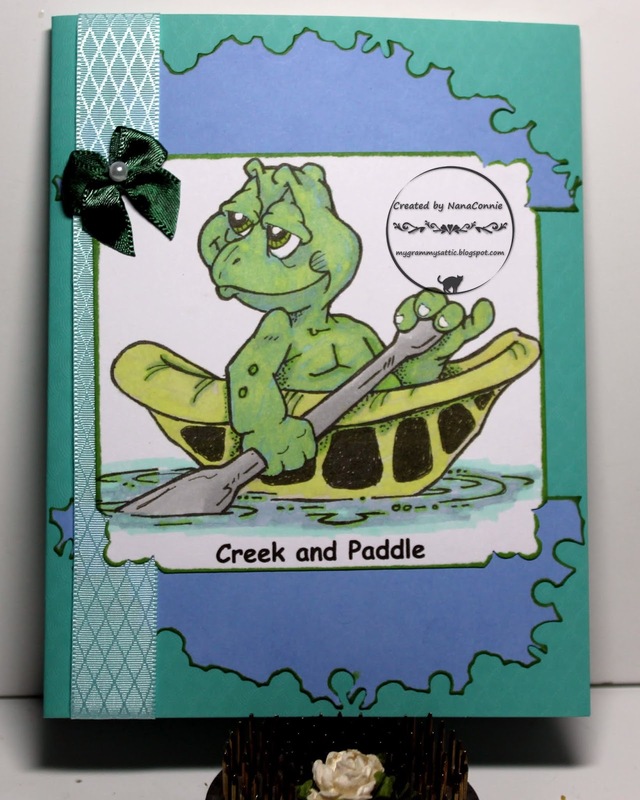 We've all heard the old expression "Up a creek without a paddle" but this little turtle (QKR Stampede - "Out at Sea") has everything securely in hand. Our newest challenge starts today and our theme is always Anything Goes. You can find the challenge by clicking on this QKR Stampede link. I colored him using ProMarkers, cut the image with a square die from Spellbinders, and punched 2 corners with a Fiskar's corner punch. The blue die cut "splash" is a discard scrap from a die by Amy's Designs which I cut in half before using. Everything is laid out on a sea foam card blank. The ribbon is from Really Reasonable Ribbon and the bow is one of those I make by the dozens and I dyed it green with a ProMarker. I wasn't sure what color combo I was going to use when I started coloring this image but I love what happened to it during the process. Can you believe I started with pale green dragons? They just didn't work once I decided on the purple wings. So, I grabbed both khaki and tan ProMarkers to cover the green, blending the colors with the blender as I went along. I cut the image and the frame with dies from QuicKutz. The image was printed on a piece of scrap CS, and the frame piece was also in the scrap basket. There was just enough of it to cut the frame. The three purple dp strips all came from cutting a scrap and I inked the edges of them once they were cut. I thought three sets of three, tiny pearls would be a simple embellishment and they dressed up the card without making it feminine instead of masculine. I printed the sentiment, hand-cut it, and again, inked the edges. Still a simple design and flat enough to mail easily. This cupcake is the image from Limited Runs for their Progressive Challenge this month. I used the sketch at Try Stampin' on Tuesday. 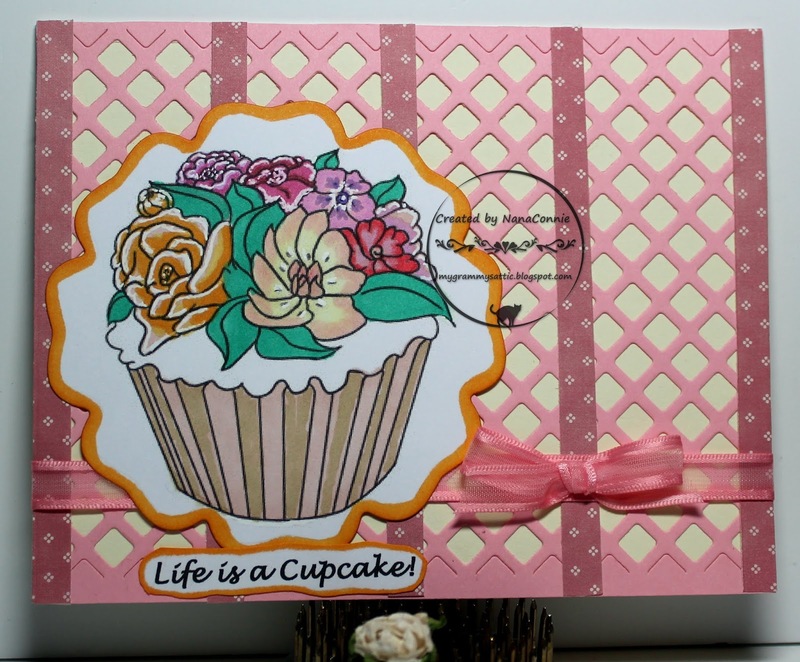 I used ProMarkers to color the cupcake, then cut it with a die from Spellbinders. 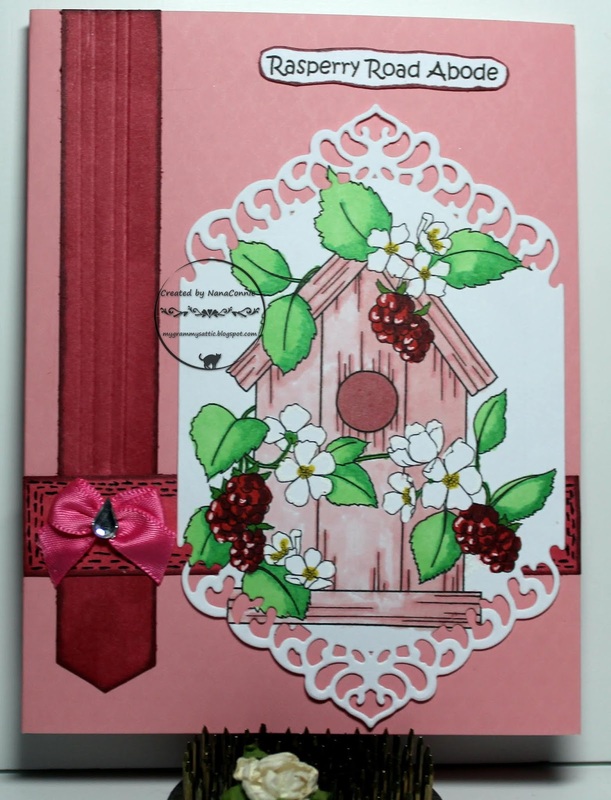 The background started as a left over scrap of pink CS which was cut with my Lattice die (Spellbinders.) 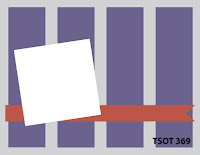 The five narrow strips of dp are also scraps. The sentiment was printed, hand cut, and inked on the edges. I found two scraps of pink ribbon in my stash basket, used one to wrap around the card front and the other one to tie a bow. I really hope I can get more of that ribbon because I really like the way it looks and it was a dream working with it. Most of us are drawn to cool waters during summer's hot days and the coast, with it's crashing waves, is often the first option for a getaway. Last summer was extraordinarily hot in my area and I headed for ocean breezes as soon as I could. This spectacular silhouette from Crackerbox Palace says it all. 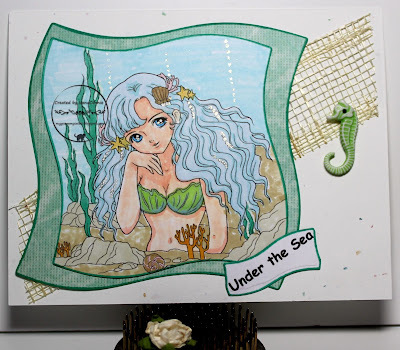 I used ProMarkers to color the sky and the ocean, then cut the image with a rectangle die from Spellbinders. The scalloped frame is also a die cut (Spellbinders.) I added two more layers of framing, one a simple rectangle and the bottom one punched with two different Fiskars corner punches. All of that went onto an eggshell white card base. I printed and hand-cut the sentiment, matted it, and added it to the top of the card. The only embellishment was the one, hand-sewn bow. I colored with ProMarkers and polychromos pencils. 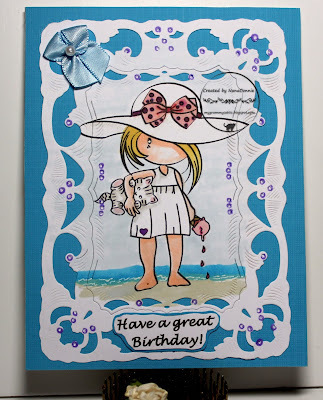 The image is fussy cut with a craft knife - not easily done! I found the sparkly silver ribbon in my Christmas stash and used two strips of it to border the image. I added one of my signature, hand-sewn bows, but this time I added a glittered flower instead of the usual pearl. 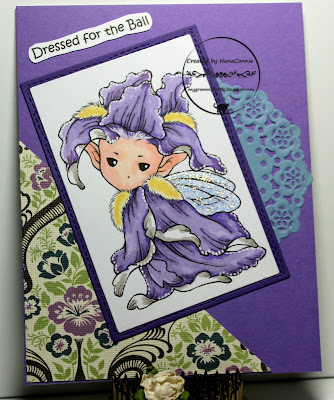 This adorable image is from Di's Digi Stamps and I knew the minute I saw it that it called for blues and purples. 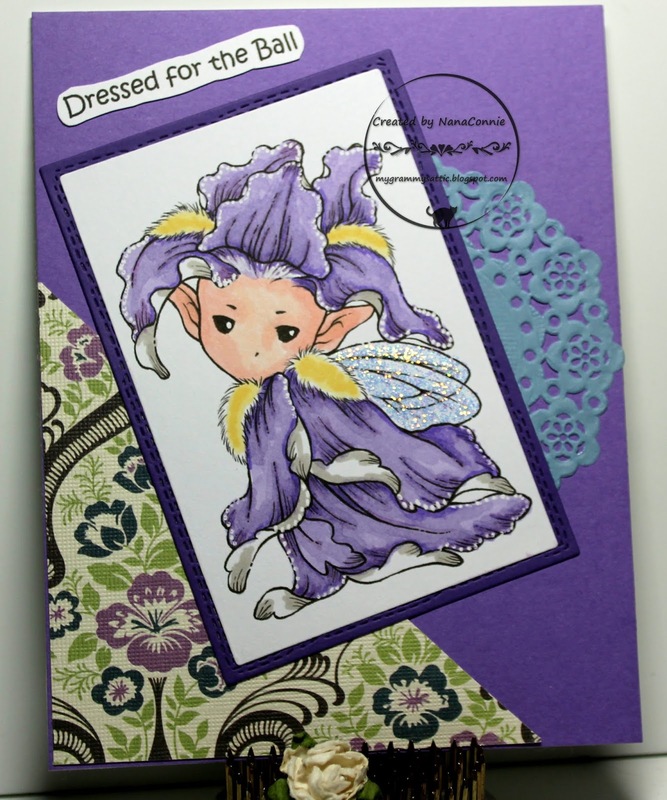 I colored with watercolor paints then cut the image with a die from Sizzix. I inked the scalloped edges and started thinking about how I'd do the background. Lying on my craft desk was a scrap of white lace but white just didn't make the image pop. I grabbed my Dylusions Ink Spray (Grape) and used it to dye the lace. The lace was marvelous when put onto white CS and really made the image the focus. I found a scrap of dp in the basket, trimmed it to size, and placed it diagonally across the lace, then I added the image circle. I sewed together one of my signature bows with a dark pearl and added it for embellishment. The sentiment was printed, hand cut, and inked on the edges to match the image piece. I started this card with a particular idea in mind but it took off on its own and I admit I like it even better now. :-D The image is from Beccy's Place. 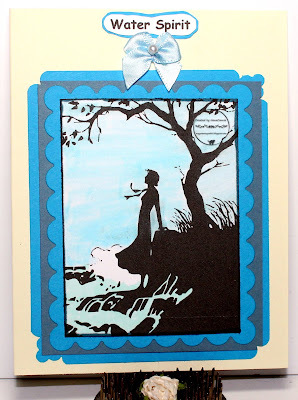 and I used colors from 2 Sisters on the Blog. I used my ProMarkers to color the image and I added highlights to the berries with white gel ink. I cut the image with a Spellbinders die. Both dp strips were in the scrap basket and I dug them out because they matched the colors in the berries. I did faux stitching on one of the strips, scored the longer strip 4 times with my new Scor-Pal (which added some great texture! ), and then added a pink, satin bow with a gem placed in the middle of the knot. The sentiment is printed, hand-cut, and inked on the edges. This is my second post today so be sure to scroll down to see the GDT card I did for Colour Crazy. 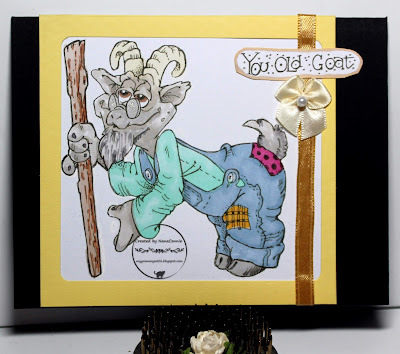 I've done another masculine birthday card for the challenge which starts today at QKR Stampede. Our theme is always "Anything Goes" and it doesn't matter whether or not you use an image from QKR, but if you do, your entry goes into a separate draw and that increases your chance of winning by a huge amount. I was inspired by the colors at My Favorite Things. I colored with a combination of ProMarkers and polychromos pencils, then cut the image with my paper trimmer and cut out the inside of the yellow, overlaid, frame with a die from Cheapo Dies. I wrapped that in gold, satin ribbon and layered it onto a black card base. I printed and hand cut the sentiment, then inked the edges before applying it. Finally, I added one of my signature bows. This is my last GDT card for Colour Crazy but I've been invited to join the team next fall. 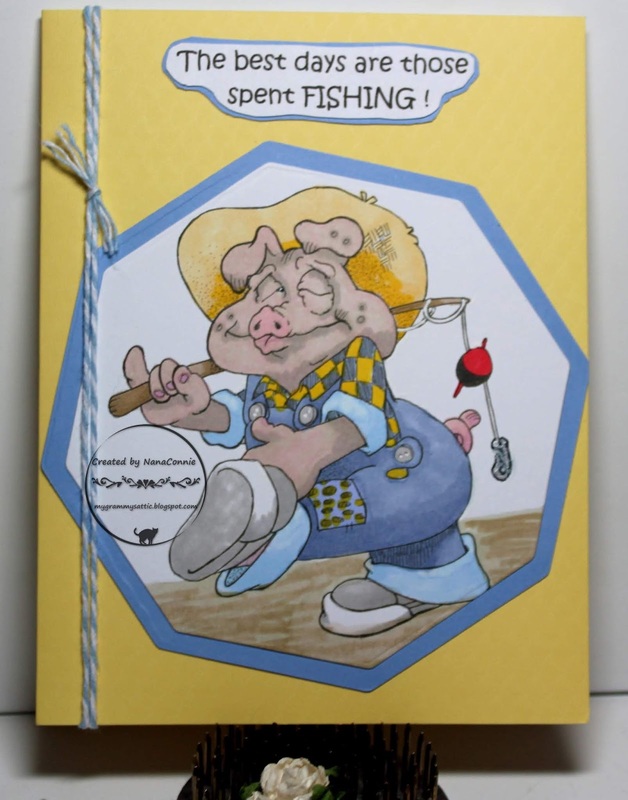 :-D The theme is always "Anything Goes" and we do require hand coloring on your projects. 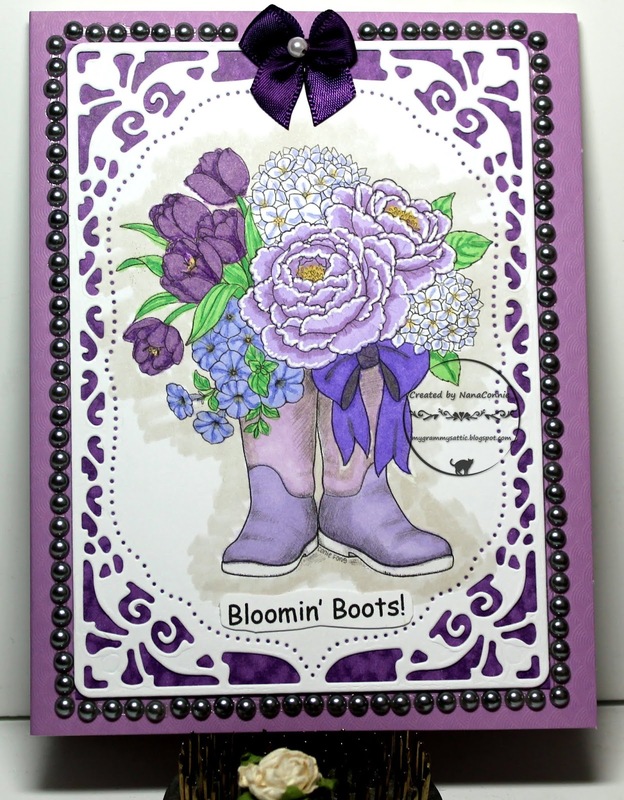 My card today uses an image from Conie Fong called "Bootiful Bouquet." I colored with ProMarkers and gel inks, then cut the image with an Unbranded die from Cheapo Dies. I framed the die cut with pearls and added one of my signature, hand-sewn bows. I printed the sentiment, cut it by hand, and added it below the boots. I really love that image! This is the first time I've used it but definitely not the last. I always envied my school-days friends who had summer birthday because, even though they complained about the lack of classroom recognition of their special day, they could go to the beach for their birthday! 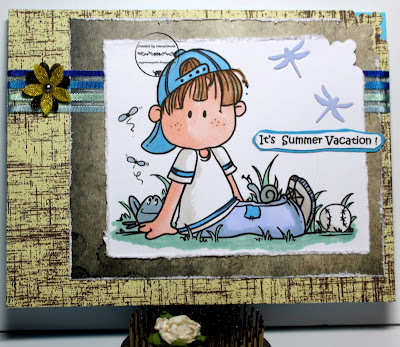 This cute image from Sasayaki Glitter is my way of celebrating all that summer fun. Ice cream, the beach, and her kitty - what else could a gal need on a summer day? and the Color Sisters had some great inspiration. I colored the image with ProMarkers, then cut it with a die from Spellbinders. I inset that cut into the frame die, also from that Spellbinders set. I printed and fussy cut the sentiment, matted it with CS, hand cut that, and applied it at the bottom of the image. The bow is one of those I sew together by the dozens and toss in my stash for future use. I mounted everything onto turquoise CS which became the card front. CAS but more complex looking because of the complexity of the framing die. 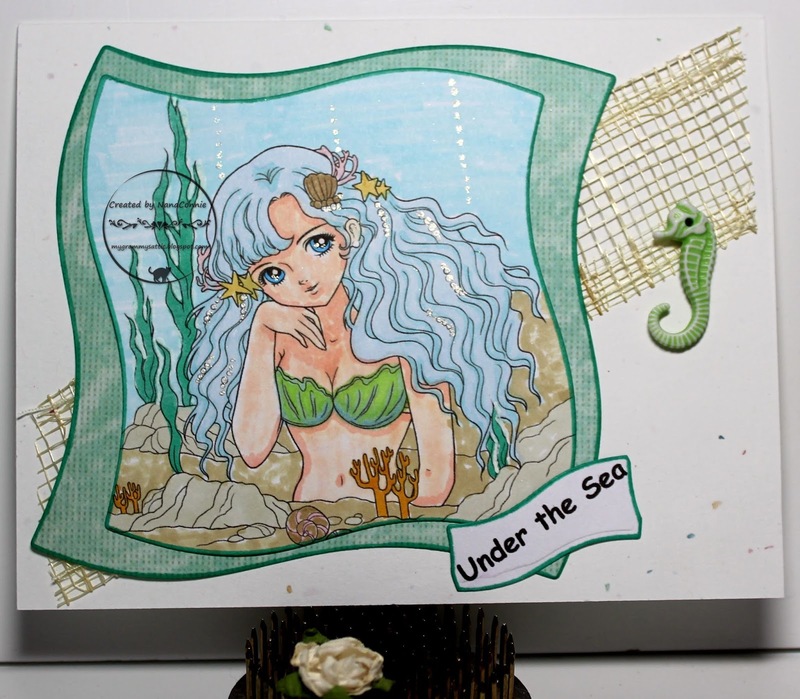 OK, now that I have all those who read the post title humming that song in their heads... :-D This sweet mermaid image is from Lemon Shortbread and this is one of the images I chose when I was a winner at one of their recent challenges. Of course, I also went on a shopping spree so maybe this is one I bought - I don't actually remember. 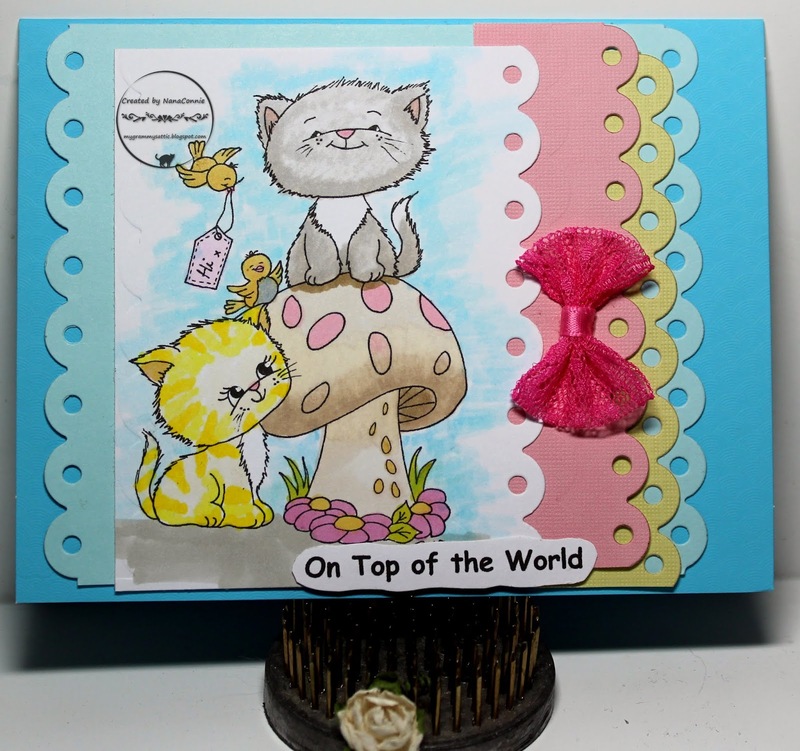 I colored with ProMarkers, added glitter ink to the bubbles, then cut both the image and the dp frame with Wonky Square dies from Spellbinders. Instead of lining up the frame exactly with the image, I turned the frame a quarter turn which seemed to accent the 'wonkiness' of the die cuts. I also cut the printed sentiment with the smallest wonky die but this time I had to do it in two cuts, moving the die before the second cut to fit the size of the sentiment. I used a scrap of mesh 'ribbon' and I think it added to the ocean theme. I found the seahorse charm in my stash and used it as the primary embellishment. I wanted the design to be as CAS as possible so that the image would be showcased. I don't know about your family but summer break from school always meant splashing in the creek, catching pollywogs, toads and frogs, and maybe a little baseball for the sons or grandsons. This adorable little guy from Bugaboo Stamps made me think of those lazy summer days. Believe it or not, I dug out the papers and the ribbon before I ever started coloring the image. I already knew I wanted to do something 'distressed' so I chose the two distressed papers and die cut the flower petals from soft foam (Cheery Lynn), THEN I started coloring with my ProMarkers. I so rarely remember to choose my papers first and, in this case, because I chose very neutral papers, it made no difference in the coloring. However, the ribbon inspired me to use the various shades of blue in coloring the image. Once finished, I cut the image with a rectangle die from QuicKutz, and I used a craft knife to distress the edges. I did the same with the first paper but left the background paper as it was. I punched one corner of each of the papers plus one on the image, using a Fiskars corner punch. The dragonflies were done with a die from Die-Versions. I printed and matted the sentiment, cutting both by hand, then added the two layers of flower petals with a pearl in their center. 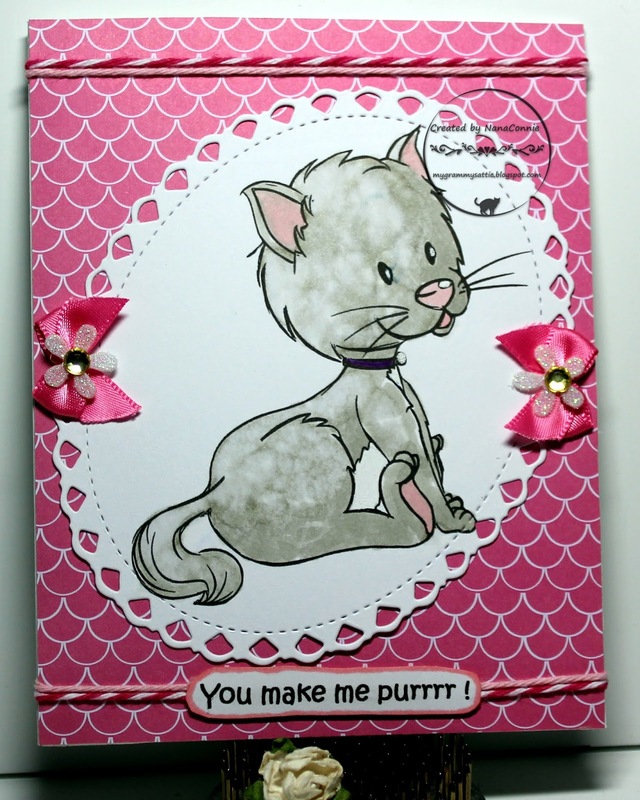 This kitty image from Pink Gem just stole my heart and I turned him into a birthday card. turned a quarter turn to better fit the image shape. 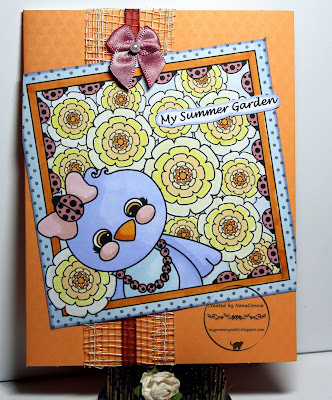 I use ProMarkers to color the image, then cut it with stitched border dies from Spellbinders. 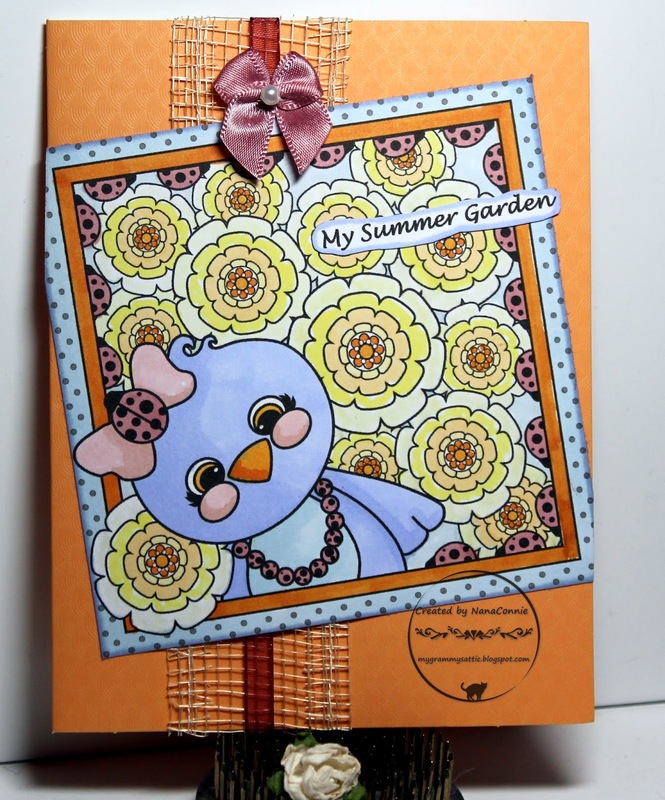 The dp are scrap pieces from the basket and the card base is textured CS. 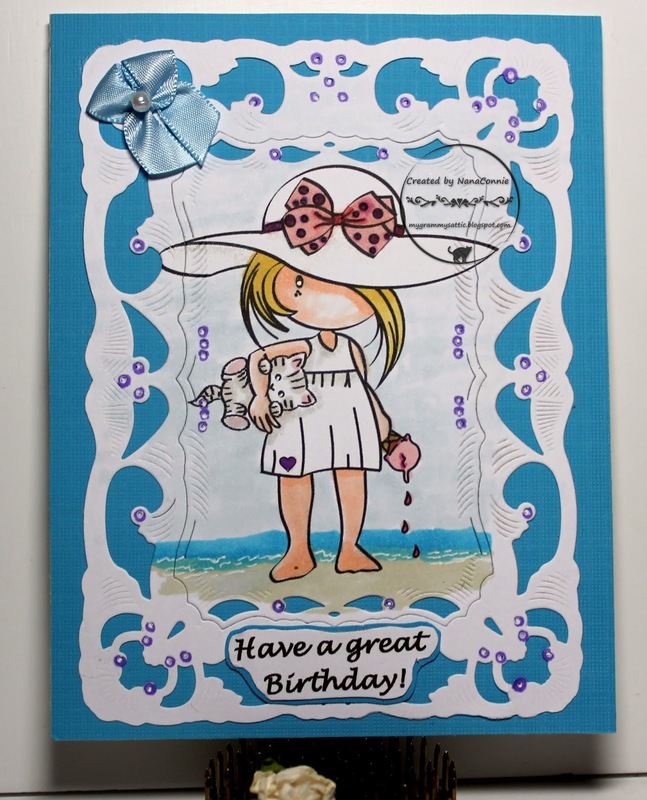 I found sheer ribbon in my stash and wrapped it around the card front. I decided to make a flower out of two layers of petals, then glittered the top petals. I added one pearl to the flower embellie and complemented that with pearls in the centers of the flowers in the image. The sentiment is heat embossed. 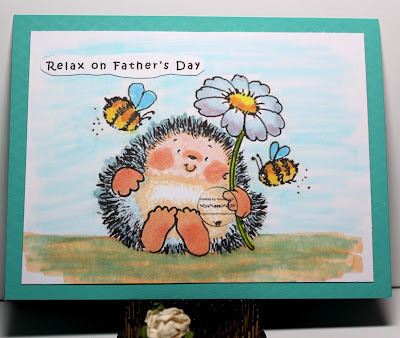 Today I have another Father's Day card made with a Penny Black stamp. 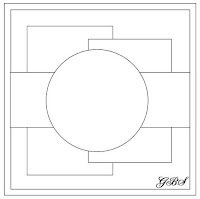 I love this stamp and have used it several times for either gal or guys cards. Today, it's on a very simple, masculine, card. I colored him with a combination of water colors and ProMarkers. I wanted a really CAS design which would be easy to put in an envelope and mail so all I did was cut the colored image with a die from QuicKutz and mount it onto a turquoise card front. I do cards for all the "Dads" in my family every year and those include my son, grandson, and SIL. My own dad has been gone many years now but I was so close to him, I always think of him on Father's Day. Today's card has one of the happiest little mutts ever and would have been perfect for my dad who was a true animal lover, but mostly dogs populated his life in the years when I was growing up. The image is a Penny Black stamp. 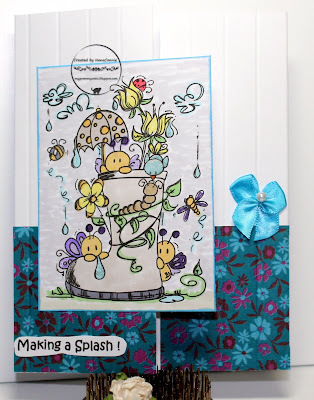 I colored with watercolor paints and a brush, then cut the image and frame with dies from Amy Designs. The die cuts were so detailed that I simply layered the image onto the yellow card front, added the sentiment, and left it without embellishment. It's a pretty CAS design that looks more complex. Another Friday morning means another challenge starting over at QKR Stampede. Remember, our theme is always "Anything goes" and you can use any image you choose, from any company. However, if you use an image from QKR or their sister company, Eureka Stamps, your entry will be put into a separate draw, significantly increasing your chances of winning some fabulous QKR Stampede images! 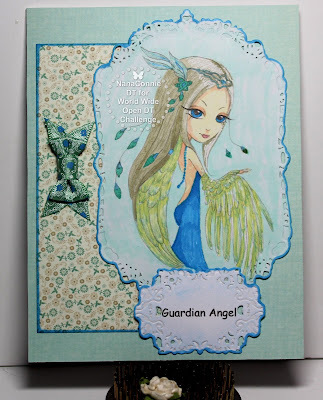 For my card this week, I used "Heaven's Angels" for the sentiment and "Dancing Angel" for the image. I colored the image with ProMarkers, then fussy cut it with scissors. The yellow die cut in the background is a frame cut with dies from Cheapo Dies. The sentiment was printed and hand cut. 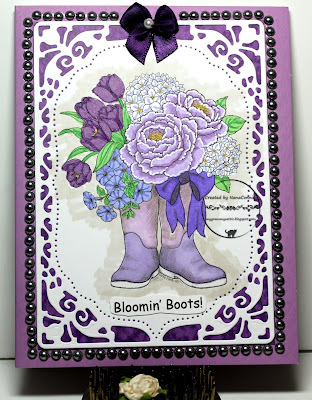 Everything was layered onto an embossed card base. Time for the June challenge at World Wide Open DT Challenge. You'll want to check out the winners post, too, just in case you might be one of them. For my DT card this month, I've used the Julia Spiri image, "Ofelia Angel." Isn't she lovely? The coloring of the image is done with a combination of ProMarkers and polychromos pencils. 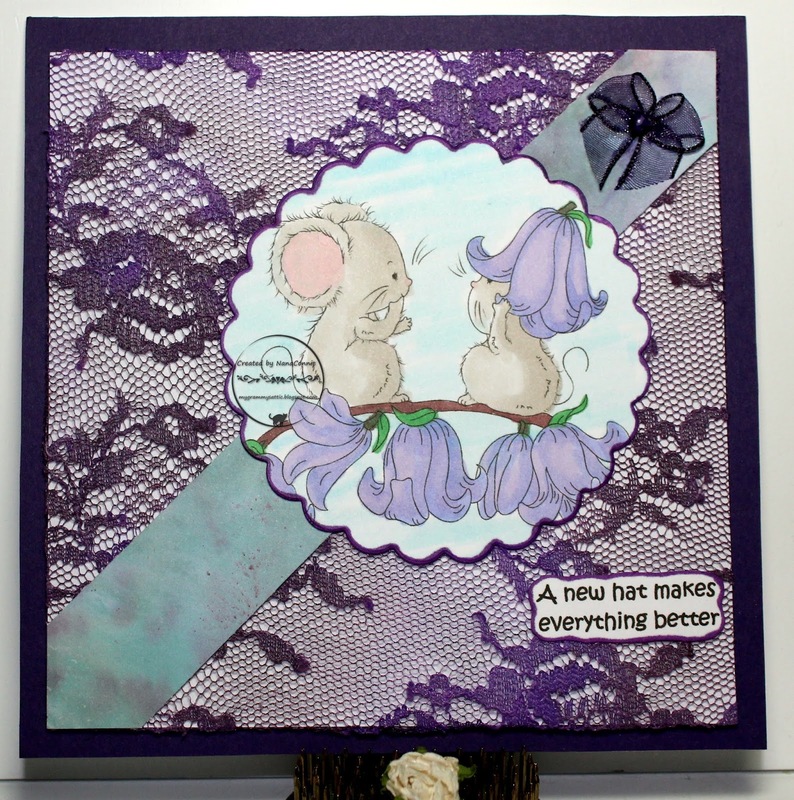 I used dies from a Spellbinders set to cut both the image and the sentiment. I used one of my ProMarkers to ink the edges of the die cuts. Before I show you my card for today, I want to tell you the back story as I heard it. A neighbor of mine asked me to make an anniversary card for friends of hers and it had to have daisies on it. Why daisies instead of romantic roses wrapped in diamonds? This couple went to see a movie on their first date and she said she decided he was "The One" that very evening because he chose the movie and it was a chick flick just for her! He took her to see "You've Got Mail" and she loved the line in the movie about 'daisies being her favorite flower because they are so friendly.' She had two little daisies tucked into her wedding bouquet and every year on their anniversary, hubby gets her daisies - even if he has to pick them from their own garden. :-D What a sweetheart of a man. So, here's my card done for their anniversary. The image is from Di's Digi Designs. 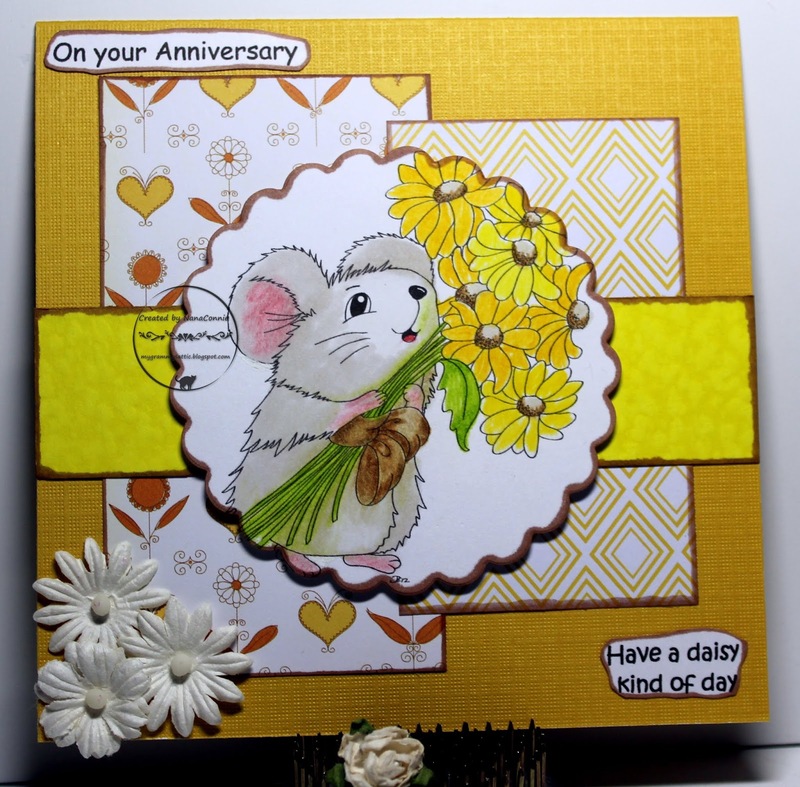 I wasn't really sure about a woodland mouse as the main character on an anniversary card but, while I haven't had a report from the couple yet, my neighbor who commissioned it absolutely loved it. I started with the sketch from Cheerful Sketches. I used watercolor paints and polychromos pencils to color the image, then die cut it with a die from Sizzix. The two main dp pieces are scraps from my basket and were cut with rectangle dies from Spellbinders and QuicKutz. The yellow strip is hand-bleached CS. 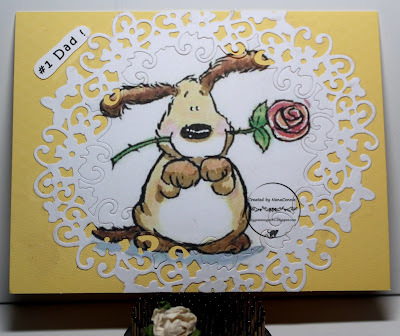 All of those pieces and the sentiment pieces were inked with a distressed ink pad from Tim Holtz. 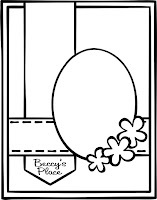 In my stash, I found three white daisies for embellishment and added them to the lower corner. 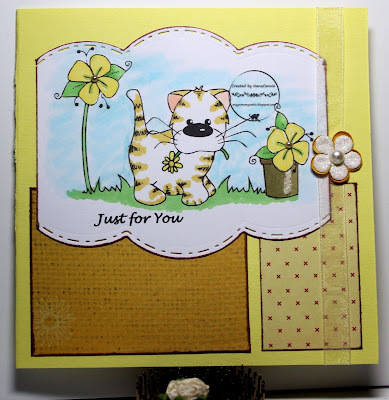 Everything is put onto textured, gold CS which I used for the card front. I think this is my first, or maybe second, time using an image from All Dressed Up and I think she's just as cute as a bug! even though I missed the deadline for their challenge. I used ProMarkers to color the image and cut it with a die from QuicKutz. 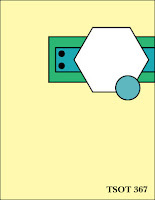 The small, red, hexagon was also cut with another die from that same set. The card front is dry embossed. The bits of dp are from my scrap basket. I love the CAS design allowed by that sketch. I used ProMarkers to color the image and an Unbranded die to cut it. The dp came from a DCWV stack and the baker's twine from The Twinery. It's been in my stash for longer than I care to admit. The little bows were hand tied and I added the tiny glittered flowers for a bit of sparkle. 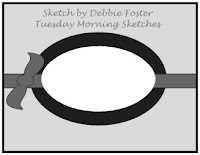 I used the sketch I found at Tuesday Morning Sketches. I colored with ProMarkers, polychromos pencils, and gel pens. I added glitter to the diamonds on her costume and used white gel ink on all the pearls. The image is cut with an Unbranded die. 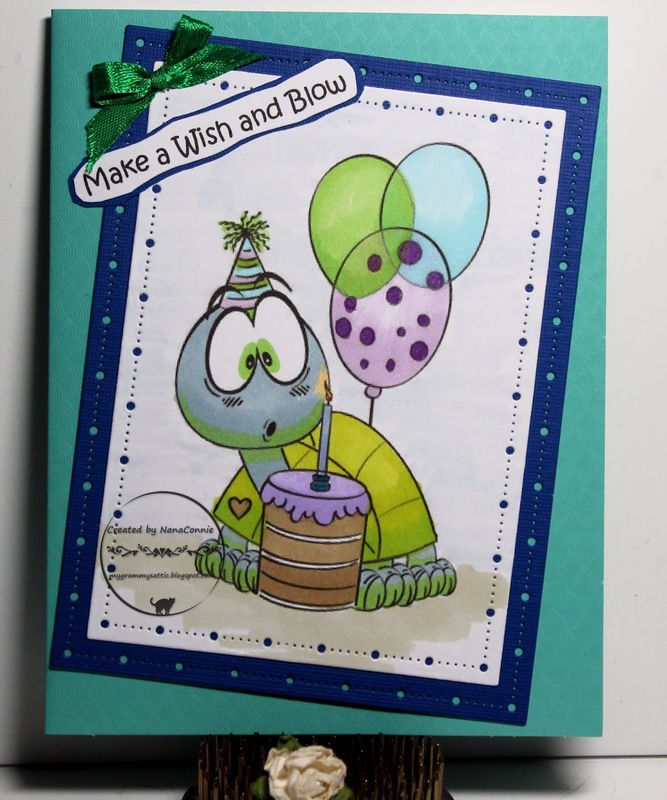 The turquoise CS is embossed with my "Linen" folder and added to the card front. I took a piece of patterned dp from another project (which went into the 'round file' after I saved some of the dp and embellies) and cut it with a border die from Spellbinders. I added it on top to the CS to make the upper triangle. I printed and hand cut the sentiment, matted it with the same recycled dp, then added the satin bow, complete with a pearl. Salute and a good Friday morning, my friends! We have a new challenge starting over at QKR Stampede today and our theme is always Anything Goes. It's definitely summer weather around here and I'm getting Father's Day cards done for the three dads in my family (son, SIL, and grandson.) Anything related to fishing always reminds me of my own dad so I used "Gone Fishing 12601" from QKR for this card. I started with a simple A2 card design. I love A2 and it's probably my favorite card shape and size because I mail so many of my cards and that's a standard size accepted by the post office with no additional postage. This one will be in the mail to my son. I colored with ProMarkers and polychromos pencils, then cut the octagon shape with a die from QuicKutz. I added a blue, CS, mat behind the image. The card front is embossed, though that doesn't show very well in the photo. I added the image piece and then wrapped baker's twine around it. I printed and hand cut the sentiment, matted it, and then adhered it at the top of the card. 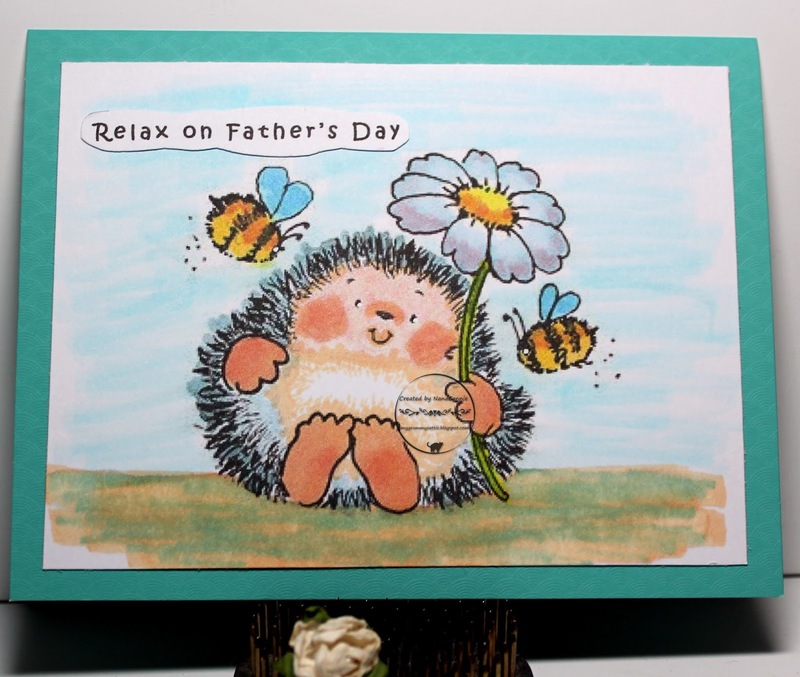 A CAS design, perfect for a masculine Father's Day card. On Top of the World is how I feel this morning! It's my first official day as a member of the DT at Crafting with an Attitude. We have a new challenge which begins on the first Thursday of each month and runs throughout the month. Our challenges are always "Anything Goes." This month, we are sponsored by Di's Digi Designs. The image I used is from my own collection and is called "King of the Castle." However, when I searched the store I found only a different version of this stamp. It has a butterfly instead of the little birds. Still, it's really adorable so well worth checking out. 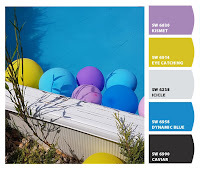 I was influenced by the colors in the Incy Wincy challenge. 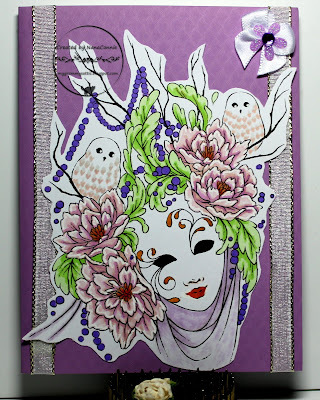 I used ProMarkers to color the image and cut it with one of my border dies from Spellbinders. I cut three scraps of CS with the same border die and layered them all together for some texture and dimension. I did my best to match those to colors in the image. I made a "bow tie" bow from scraps of lace (dyed pink with a ProMarker) and satin ribbon for the wrap, then printed and hand cut the sentiment. Another fun and silly image from Sasayaki Glitter for their monthly progressive challenge. Fortunately, by using it I've added one more birthday card to my stash and that's great because I have a whole series of masculine, family, birthdays coming up over the summer months. Well, they said the really hot weather would arrive last weekend but we jumped from 84F on Thursday to 100F on Saturday and 102F on Sunday! I know it'll get hotter over the upcoming summer but an almost 20 degree jump over a single weekend nearly wiped me out. I'm ready for a month at the beach! I cut the image with a Bo Bunny die which included the delicate frame that allowed me to inset the image. The patterned, blue, dp is a left over scrap from a Recollections stack and the chevron dp is also a scrap but I can't remember the maker. The textured, brown CS came from the scrap pile. Come to think of it, even the image was printed onto a scrap. 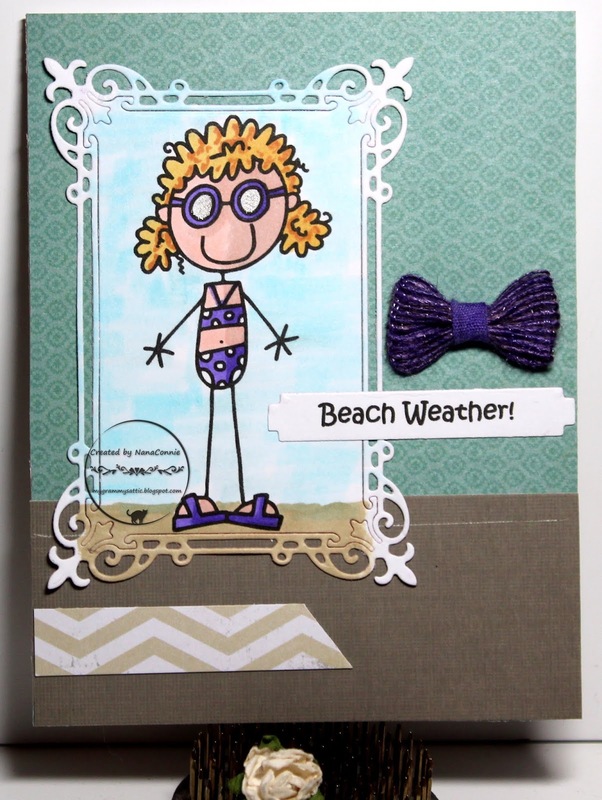 The bow is one of the wrapped-burlap bows I make but I 'dyed' this one with a purple ProMarker to match her bikini and flip flops. Overall, this is a pretty CAS design but the dp patterns and fancy die cut make it look much more complex. The newest Progressive Challenge is on at The Outlawz and I got my entry finished this morning. The image is from We Are 3. I colored with ProMarkers and water colors then cut the image with a plain square die from QuicKutz. I inked the edges and added the sentiment. 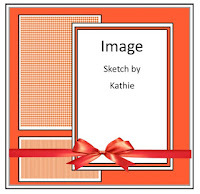 The card front is dry embossed and I wrapped it with mesh fibers and sheer ribbon before adding the image piece, tipped on an angle. The hand-sewn, satin bow was the final touch.